I booked a 9:00 am flight from Sacramento to Phoenix. Unfortunately, Southwest has having some struggles with a number of flights. The flight eventually took at about 9:40 am and got me to Phoenix about 11:30 am. Once I collected everyone, we headed to Maryvale. 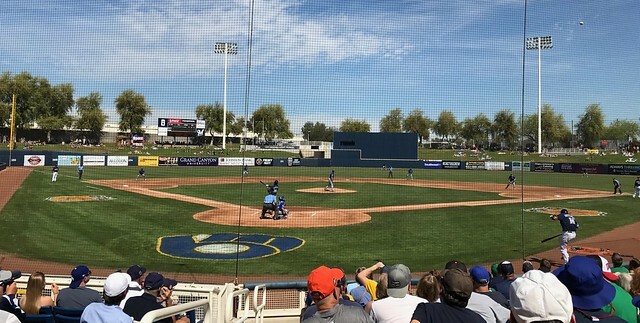 The game for the first day was the Brewers versus the Royals. The Royals won the game by the score of 8 to 5. The Royals scored 3 runs in the top of the first and the Brewers followed with 5 runs in the bottom of the first. I was surprised to see Eric Sogard playing for the Brewers. It is a big group for all three days. I have affectionally called it the Wallen Family and Friends Spring Training Trip. Friday included lots of Wallens (11), including: Wallen and Jill; Bob; Kyle and Mary Rose; Bill and two of his sons; Jenny and CJ; and, Carol. The hanger-ons included: Tomasin; Snipes and Keith; Doug and Bob; and, me. Like past years, Marcus from Wallen's office was there with two of his buddies. They are like ghosts; I hardly ever seen them. Dennis, a friend of Wallen's who now lives in Tucson, was also there. The group totaled twenty-one. After the game, Tomasin, Snipes, Keith and I ended up at the Purple Turtle near the stadium. We watched most of the UC Davis versus Kansas NCAA basketball game. For the first time in history, UC Davis was in the tournament. They won their play-in game on Wednesday. They got beat up by Kansas; the score was 100 to 62. There was a wild mix of people at the Purple Turtle. In one corner near the entrance, there was off track betting! From there, we headed to the house that the Wallens were renting in Northeast Phoenix. They cooked a nice pasta dinner. After watching more basketball, we eventually headed to our hotels. Although Snipes and I had coordinated, he ended up at a Holiday Inn about 3 miles from where I made a reservation at the Residence Inn. After dropping Snipes and Keith, Tomasin and I crashed at the Residence Inn after 11:00 pm.